I have to support some software running under Debian Linux 5.0 (lenny) on ARM hardware. The operating system on this hardware can’t easily be upgraded because it’s expensive to get at physically, but there is a mechanism for updating the application it runs. This is an interesting problem in maintaining old software. The ‘stable’ releases of Debian have a reputation for being rather infrequent and almost out-of-date by the time they’re released, but in this case, a release every two years is too often! In embedded applications, having the latest and greatest doesn’t matter as long as it works and doesn’t change. I have recently had to build a new release of the application software for this ARM hardware. My main Linux machine is now running Debian 7.0 (wheezy), which does a great job of cross-building for ARM, but unfortunately the resulting binaries are linked with libstdc++.so.6.0.17. The old lenny machines have version 6.0.10, which is too old to run these binaries. I fiddled around for a while trying to install older libstdc++ packages under wheezy, but found myself in dependency hell, so I decided simply to revive an ancient PC which was already running Debian 6.0 (squeeze) and press it into service for doing the build. and my library package was built and installed automagically. Nice. However, this wasn’t enough. It turned out that I really had to build everything on lenny in order to get it to work – it seems that the libstdc++ from wheezy is compatible with squeeze, but neither wheezy nor squeeze is compatible with lenny. and everything happened as it should. Now at last I could build my code and, with fingers crossed, run it on my embedded Debian Lenny machine. I have to say that I think Debian’s support for cross-building is outstandingly good. Tools like apt-cross and xapt make it much easier than it could be, and the work continues with the multiarch project which improves support still further. This entry was posted in Raspberry Pi and tagged ARM, embedded, linux on July 26, 2013 by martinjonestechnology. 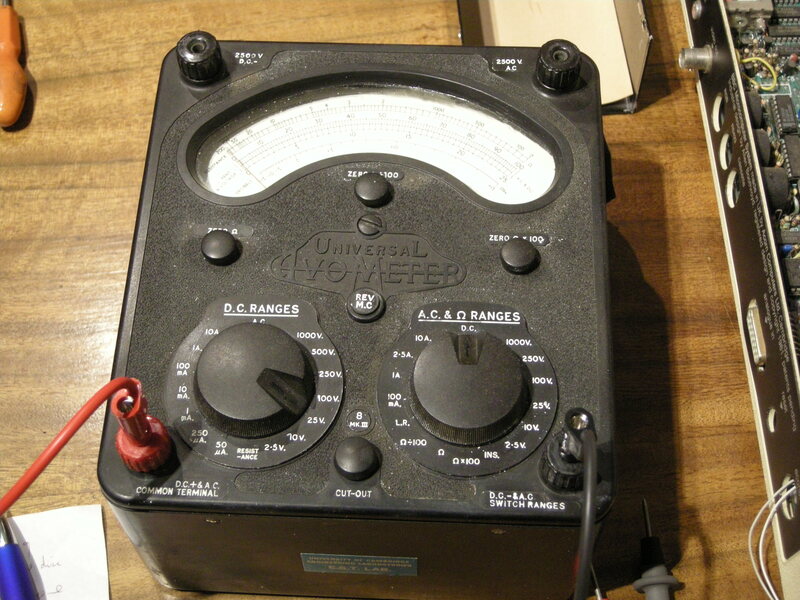 The Avometer 8 is a British electronics icon. 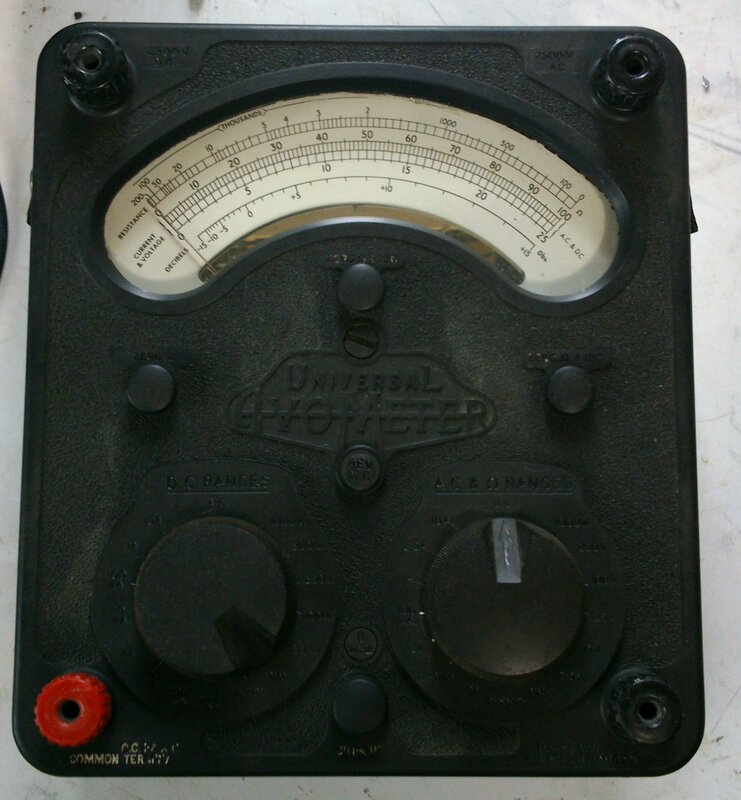 For probably half a century it was the standard high-quality multimeter, found in every factory, workshop and laboratory. Though an analogue meter seems like an anachronism in today’s digital world, it’s still useful for some tasks, and there are decades’ worth of service manuals and test procedures which still call for measurements to be made using an Avo. They only stopped making them in 2008 because some parts were no longer available. It’s clear that everything is hand-built, and should be quite serviceable. 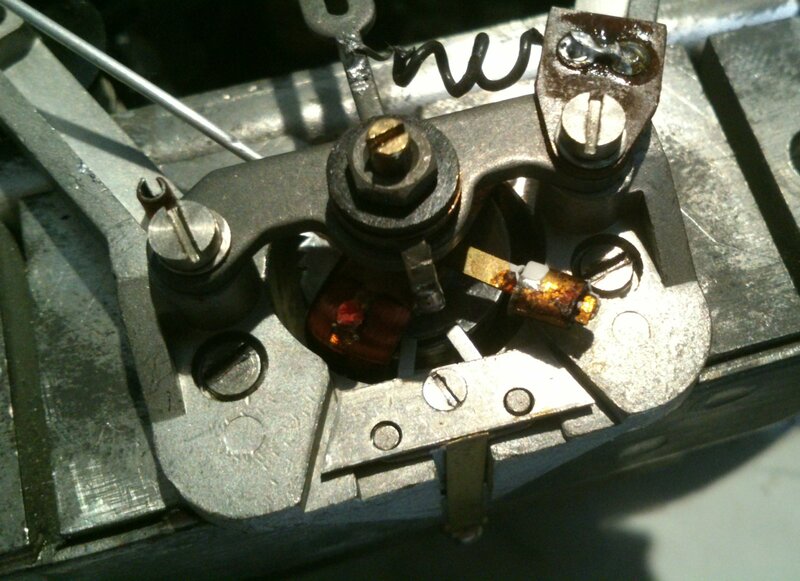 The problems with this meter seemed to be in the movement itself – the sensitive, fragile coil suspended by precision bearings in a big magnet – rather than the electronics. The movement is so delicate that I was worried about wrecking it rather than fixing it! However, it’s only held in with two screws, so I could take it out and see what needed doing. In the picture above, the movement has been taken out and is standing on top of the rest of the meter. 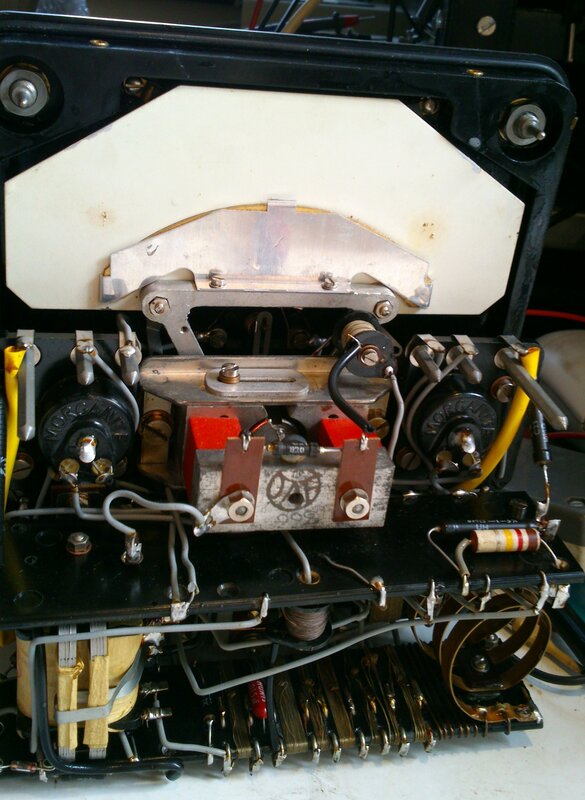 With the benefit of a little advice, and a very handy article from the Amateur Radio Relay League in February 1943 called ‘Rejuvenating Old Meters‘, I set to work. 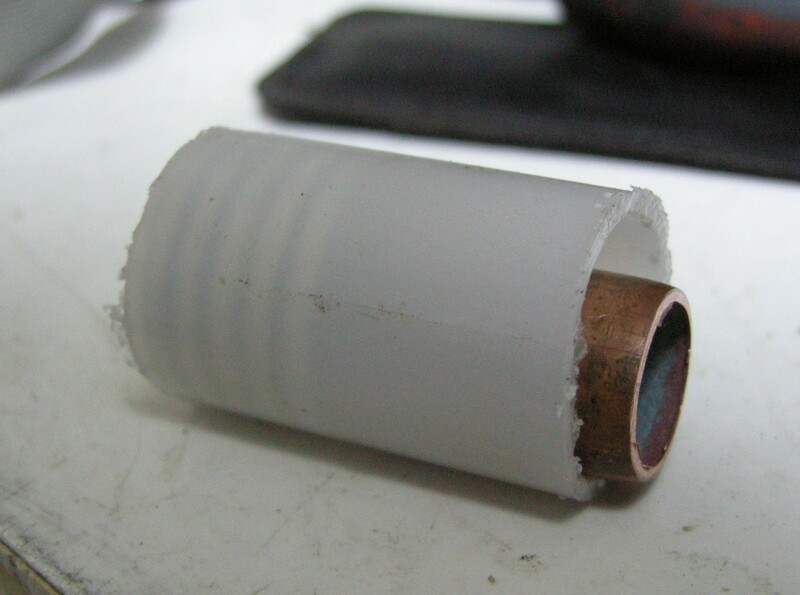 The gap in the magnet in which the coil is suspended was full of tiny iron filings. They’re not supposed to be there. 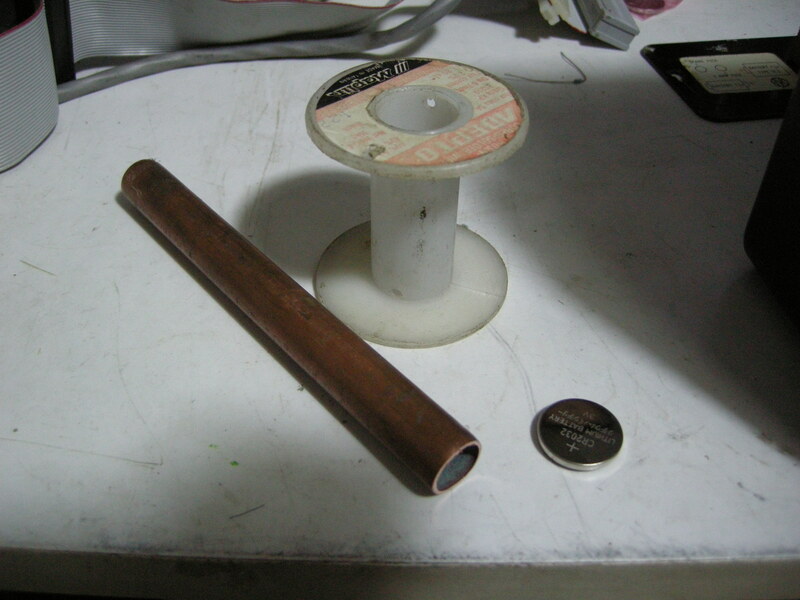 They get in the way, causing the coil and thus the pointer to stick, and they short-circuit the magnetic field, reducing the sensitivity of the meter. I cleaned them out in the recommended way using a little piece of Blu-tack. The bearings suspending the armature were way out of adjustment: it rattled and caught on the centre pole-piece of the magnet, again making it stick. I adjusted the bearings, centring the hairsprings and the coil in the gap and just taking up the slack so it could move freely. The bearings in the Avo are sprung, so the armature is never quite rigid, but there should be no rattle in it. Things were looking up, but there was still a problem. The movement wasn’t balanced, so the position of the pointer was very sensitive to which way up the meter was held. The pointer assembly has three little arms, one opposite the pointer and two perpendicular to it, to which it’s possible to add weights to balance the pointer. It’s a very delicate operation. You have to hold your breath while doing it, since the slightest draught sends the pointer swinging wildly. 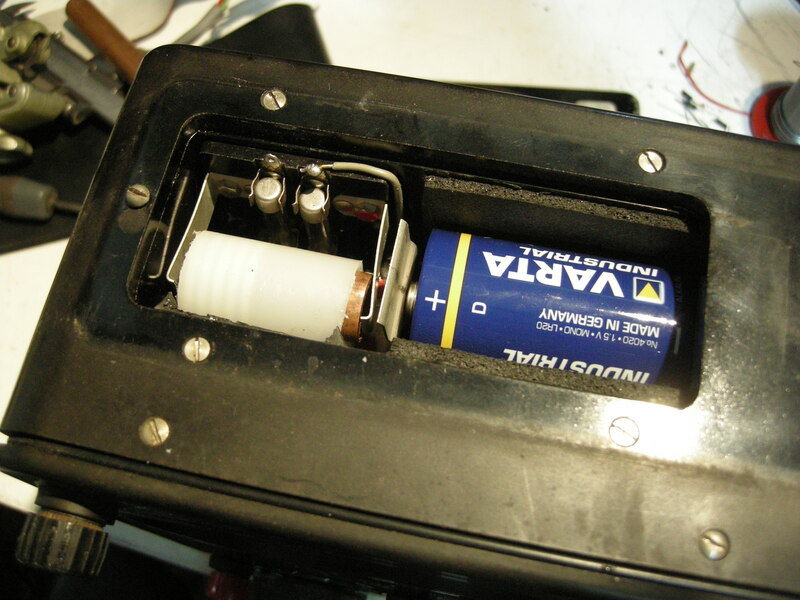 This picture, reproduced from the Rejuvenating Old Meters article, shows how the balancing is done. First, the meter is set to zero while lying horizontally. Then it’s turned to stand vertically. The tail weight is adjusted with the pointer horizontal, and the side weights are adjusted with it vertical. I used paint applied in droplets with a tiny screwdriver to add weight. You can see it in this closeup of the movement. It doesn’t take much – the balance is incredibly sensitive. Now to test it. The bare movement is supposed to take 37.5μA for full scale deflection. With a power supply and a resistor, I gave it a current of 37.5μA and it worked! I couldn’t tell whether it was exactly right because the naked movement is so sensitive to draughts that the pointer was never quite steady, but it was close enough for me. 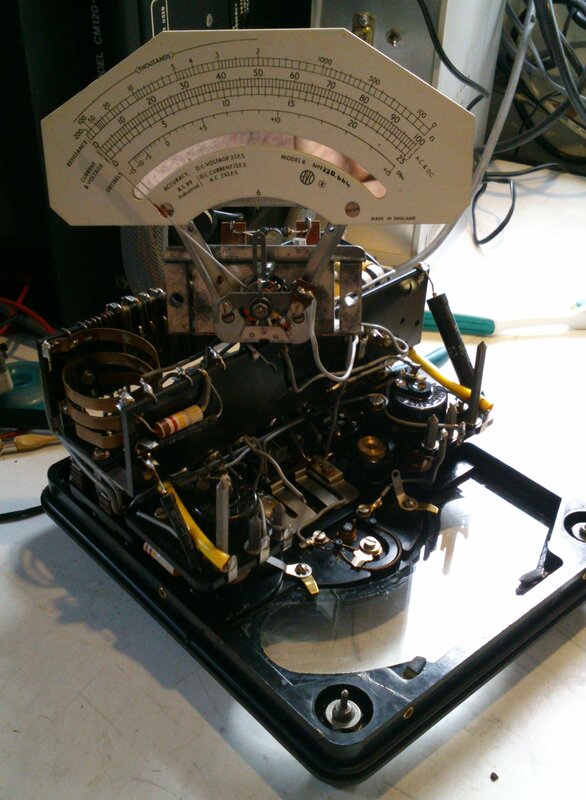 I reassembled the meter, sticking the glass (yes, real glass!) back into the case as I went, and was delighted to find that it was now working – no sticking, it returned to zero every time, and was fairly accurate. It read about 1% low, though. That’s within its specification but I thought it could do better. Fortunately the Avo designers made the meter adjustable to fix such errors. 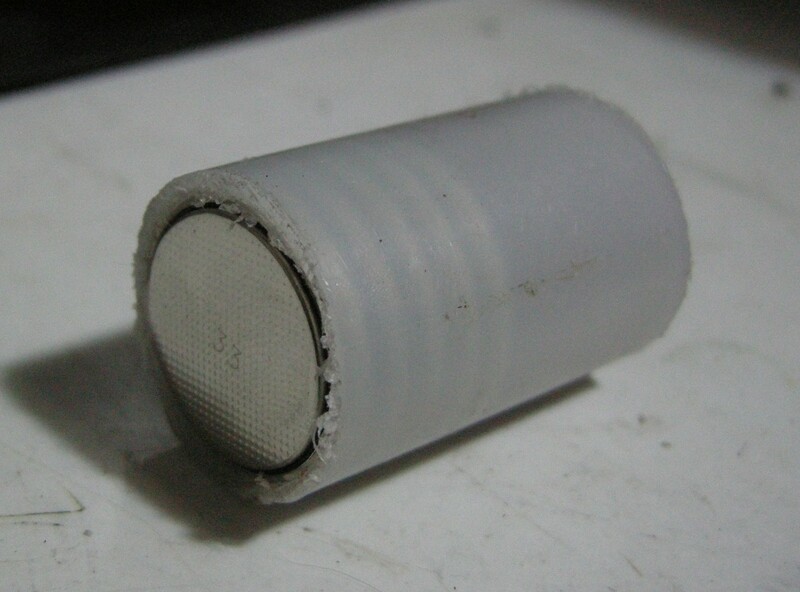 There’s a shunt on the magnet which can adjust the magnetic field a little to compensate for the slight loss of magnetism as it ages. 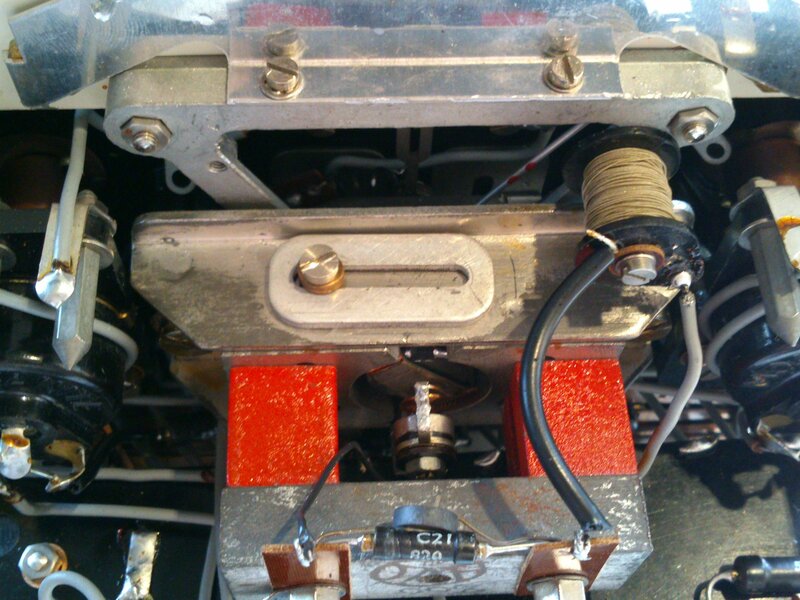 It’s the piece of metal with the slot in it, held by one screw, in this photo of the top of the movement. A couple of millimetres to the left was all it took, and the Avo now reads correctly to within 0.5%. Not a bad result, considering the only tools required were a screwdriver, a bit of Blu-tack, and some paint. Try that with a faulty digital multimeter! This entry was posted in Uncategorized and tagged analogue, electronics, test equipment, vintage on July 24, 2013 by martinjonestechnology. 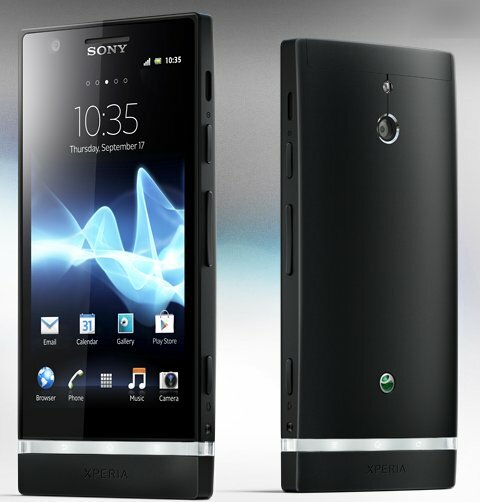 I have a Sony Xperia P (LT22i) phone. Sony have recently updated the software for it, so it now runs Android Jellybean. Last week, I plugged the phone into my desktop PC and the Sony software proudly announced that an upgrade was available. The existing (Ice Cream Sandwich) version had some niggly problems, so I thought upgrading was a good idea. Well, I was almost right. After much cursing and head-scratching, I managed to fix it, but the fix isn’t very nice. Basically I used the ‘repair my phone’ link in the Sony PC Companion software, which does a factory reset and reinstalls the software. It’s brutal, but effective. do a complete backup of the phone using the PC Companion software. Don’t be afraid of the incredibly long time it takes before it actually starts backing anything up. select the ‘Support Zone’, then ‘Phone/Tablet Software Update’, then use the ‘repair my phone/tablet’ link and follow the instructions. when your phone eventually restarts, get it connected to the internet either by Wi-fi or 3G. Add your Google account to it. Don’t try to restore the backup yet: most of it would fail because the apps aren’t installed yet. on a desktop PC, go to play.google.com/apps and log in with your Google account. It should show, under ‘My Apps’, a list of apps previously installed on your phone. Click on them and set them to be installed. the phone should now download and install the apps you’ve selected. when the apps are restored, restore your backup using the PC Companion software. Again, there’s a long delay before anything happens, but it works eventually. Expect a few error messages if there are any apps you had installed before but chose not to put back. They’re harmless. now spend ages getting everything set up the way you liked it before. Sadly the backup doesn’t keep things like your icon layout, wallpaper, notification settings, ring tones and myriad other little things. This whole process wastes about half a day, in my experience, which is annoying. But at least my phone works properly again and doesn’t drain the battery. I just wish it hadn’t gone wrong in the first place. More testing needed, Sony, please. This entry was posted in Uncategorized and tagged android, mobile phone, sony on July 17, 2013 by martinjonestechnology. I do a lot of electronics design and debugging. It’s how I make my living. Most of the things I work on involve embedded computers of one sort or another talking to various peripherals. 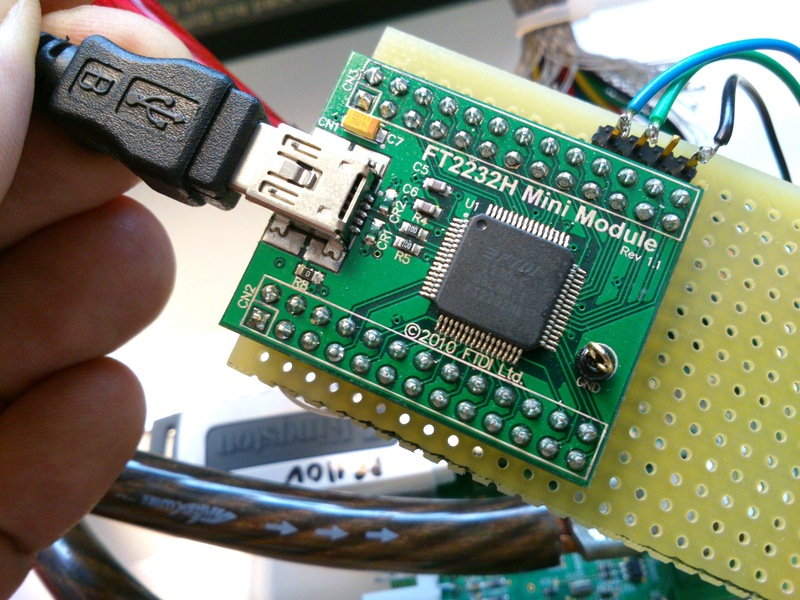 It could be an 8-bit microcontroller sending data to a simple data logger, or a sophisticated 32-bit Linux system communicating with a wireless modem. Many of these connections involve asynchronous serial ports. If something goes wrong, as it usually does, It’s really useful to be able to see what’s going on with the communications. Here’s a picture of the sort of thing I’m dealing with. It’s a board I designed which contains a load of power electronics as well as a microcontroller and a USB data logger which talk to each other using a serial connection. Note the 175A fuse next to the USB connector! Monitoring a serial port on a PC is relatively easy, but the ones I deal with are separate from the PC, stuck on some circuit board on the workbench or buried inside a piece of equipment. To complicate matters, I need to monitor both directions of traffic at the same time, and have some idea of what order things happened in. There are many protocol analyser tools out there which will do all sorts of clever things, but it’s hard to justify them for small projects. Faced with a such problem to solve recently, I put together a cheap and simple system which allows a developer to monitor both directions of an embedded serial port simultaneously, and have a record of which end transmitted what, when. It consists of a software tool and a bit of hardware. The software is a simple tool I wrote in C. It compiles and runs under Linux. Given the names of two devices, it opens both of them. It waits for a character on either of them and displays it on the screen in hexadecimal and ASCII. Each device has a separate column. Every time data arrives from the other device, it starts a new line. Each line is timestamped. In this way, it produces a dump of the conversation between the two devices, and it’s clear what order things happened in, and who said what. It has one other handy feature: it has a ‘-l’ for (‘live’) command line option. In this mode, it will update the display every time a character arrives so you can see occasional data as it happens. This is great for monitoring things like keystrokes. This mode involves a whole load of backspacing and overprinting on the display, so it’s not really suitable if you want to record the output of the tool for later examination. The non-live mode is better for that – it outputs data only when it has a complete line. Here’s an example session using the software. Here you can see that I used stty to set the baud rate of two serial devices attached to the PC. Then I ran the tool (provisionally called hdump2). You can see the data after that. The timestamps are on the left, followed by hexadecimal representations of the data, then the ASCII version. In this case we’re watching the initialisation of a Vinculum USB host controller. The data isn’t guaranteed to be in exactly the right order character-for-character, since it’s had to travel from two serial ports through the operating system, but it’s good enough for debugging. It’s free software, licensed under the GNU General Public License. The hardware can be any pair of serial ports suitable to connect to the device under test, but I made a little module which makes it easier. It’s based on an FTDI FT2232H Mini Module. In fact, that’s all it is! There are just a couple of wire links to configure its power supplies and bring the receive pin of each of its two serial ports out to a connector. There’s a load of spare space on my board which I intend to use eventually to fit various useful connectors and buffers to hook up to the different serial port standards I come across. When plugged in to a PC, two devices (typically /dev/ttyUSB0 and /dev/ttyUSB1, assuming you don’t have any other USB serial ports attached) appear. They can be used as the device arguments to the tool. Do let me know if any of this is useful to you, or if you have comments or improvements to suggest or contribute. 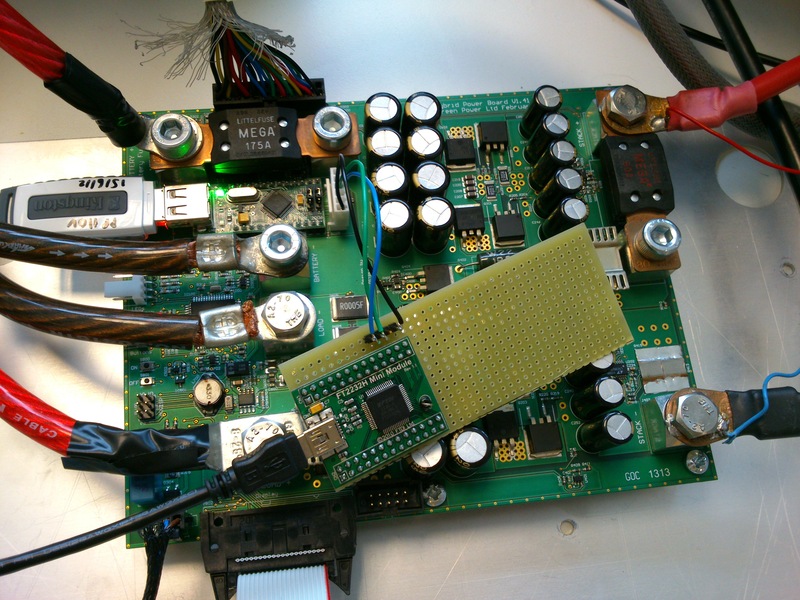 This entry was posted in Projects and tagged ARM, atmel, avr, beaglebone, electronics, embedded on July 5, 2013 by martinjonestechnology. The Balloon Board project set out more than a decade ago to produce a high-performance, low-power, open hardware embedded Linux computing platform. It successfully did that, and now thousands of them are in use in all sorts of products all over the world. One of the major achievements of the project was a build system which could configure, download, patch and build a boot loader, kernel and root filesystem using a relatively simple menu-driven interface. The menu allows the user to select which type of board to build for, and which customisations to apply. These can include custom kernel drivers for a particular application, or a different Linux distribution (Debian and Emdebian are supported). It doesn’t need an especially powerful machine to run on, but can make use of multiple CPU cores to speed up building. My colleague Nick Bane has recently, in collaboration with Cambridge University Engineering Department, updated the build system so that it can build software for the Raspberry Pi and BeagleBone Black, both of which are somewhat newer hardware than the Balloon Board. This should make it easier to port software and device drivers between the boards without having to start with a completely new development system. It might also be of interest to developers working with the Raspberry Pi and BeagleBone boards who want a simple, repeatable way to create the necessary software. This is especially important for use in manufactured products, where the process for creating a whole software distribution needs to be well understood. I used a 2GB card in a USB card reader connected to my Debian Squeeze PC. I created two partitions using fdisk. Partition 1 is a 50MB FAT16 (type 6) partition, and partition 2 is the rest of the card formatted as ext3 (type 83). On my system, the card appeared as /dev/sdc. Copy the files MLO, u-boot.img and uEnv.txt from the BeagleBone USB drive to the FAT partition. This entry was posted in Uncategorized and tagged ARM, beaglebone, embedded, linux on July 2, 2013 by martinjonestechnology.